Note that item numbers reflect the number of units per package (e.g. LW2D1500 is 500-pack of LW2D1). We suggest you order more forms than you will actually need to prepare for potential printing problems. For your information only, below is a list of all available Safeguard form numbers. To order, select one of the three form sets described lower on this page. L4UP - An 8.5" x 11" version of the W2 that contains all necessary employee copies on one sheet of paper. To order, select one of the three form sets shown below (2-UP 8.5" x 11", 4-UP 8.5" x 11", or 4-UP 8.5" x 14" pressure sealed). These are the traditional forms. 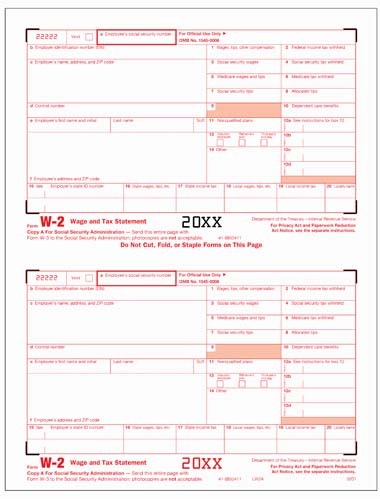 2 employees are printed on each page and you must print the forms multiple times (once for each W2 copy the employee will receive) and then tear and collate the forms by hand. LW2A for at least 1/2 the number of employees needed (2 employees per form). Not necessary if you file federal information electronically via the internet. LW2D1 for at least 1/2 the number of employees needed. Double this if you intend to print and keep a copy for yourself (the employer). This type of form contains all 4 employee copies on a single sheet. This means you can print all 4 employee copies in one pass and then simply fold the form and stuff it in the accompanying windowed envelope. LW2D1 for at least 1/2 the number of employees needed if you intend to print and keep a copy for yourself (the employer). Like the 4-UP forms above, each page contains all employee copies. However, if you have pressure sealing machine, there is no need to stuff envelopes. You can simply print the forms and feed them to the pressure sealing machine and it will fold and seal the forms to a mailable size.